Patni Healthcare Walkin Drive in Mumbai – 17th to 20th April 2017. Patni Healthcare Recruitment in Mumbai for Diploma, B.Sc students. Interested applicants must check the required details about Patni Healthcare Recruitment 2017. Here are provided the complete details about Patni Healthcare Walkin Drive like Eligibility criteria, Walkin Date, Walkin Time, Venue. Candidates who are interested they can check Placement Papers for better preparation, utilize this golden opportunity on or before the last date. It is highly Appreciable if candidates check Official notification before applying for the Vacancy. As we all know comparing to the previous years this year competition for Jobs had increased immensely. So there will be tough competition for this Recruitment. Candidates are advised to check Patni Healthcare Test Pattern so that they can prepare confidently and can easily crack the Recruitment of Patni Healthcare Recruitment 2017. Responsible for overall quality of nursing care rendered. Willing and able to routinely participate in all patient care activities. Ensure that pre-operative & post-operative patient care procedures are followed. Coordinate with the team members for quality accreditation and adhere to the regulatory body guidelines while executing nursing care activities. Responsible for policy implementation, and ensuring preparation & implementation of Standard Operating Procedures for Nursing activities to bring in operational efficiency and effectiveness for Nurses. Coordinate the functioning of the nursing staff and assist in the implementation and enforcement of the hospital bylaws and hospital policies. Responsible for bio-medical, hazardous waste management and laundry management. Oversee the housekeeping activities, maintain the hygienic environment and take measures for infection control. Responsible for clinician engagement and patients positive feedback on nursing care for enhanced center reputation. Assess needs, plan, implement and evaluate evidence-based nursing care. Provide healthcare advice through educating patients, carers, and families. Ensure the smooth running of clinical work. Contribute to the dissemination of good practice by participating in teaching and learning activities. Aspirants who are interested can attend for the Patni Healthcare walkin drive which is held in Mumbai on 17th to 20th April 2017. Here we are provided the important details like Walkin Date, Time, and Venue. So candidates who are interested they can directly attend for the below mentioned venue. 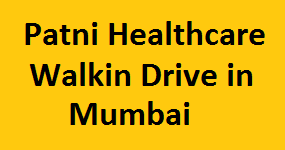 Here is the exact place to search the accurate Details about Patni Healthcare Walkins Recruitment in Mumbai. We hope that the information is useful for your job search. Keep visiting Freshers Jobs for regular Job Updates.